These fluffy and cinnamony sweet rolls are PERFECT for your Holiday breakfast or any breakfast where you need to feed a crowd. You can even freeze them to enjoy them later! 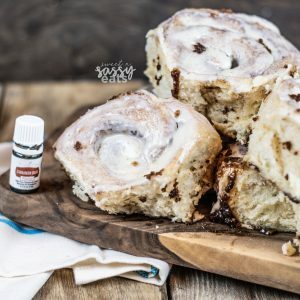 I add a special ingredient to my glaze to really BOOST the flavor! Remember my awesome Dinner Roll recipe? Well, I take that basic roll recipe and turn them into Cinnamon Rolls! 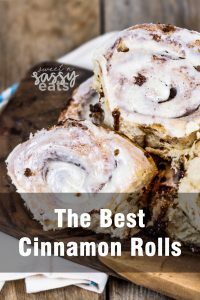 The best part is that I will just usually double my roll recipe, split the dough in half and then make dinner rolls out of one and cinnamon rolls out of the other! 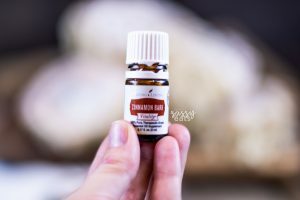 This makes my holiday cooking for the family even EASIER! You can even freeze these to have on hand whenever you want them! You just get through the steps of shaping the rolls and then instead of allowing them to rise a second time, just cover and pop into the freezer! 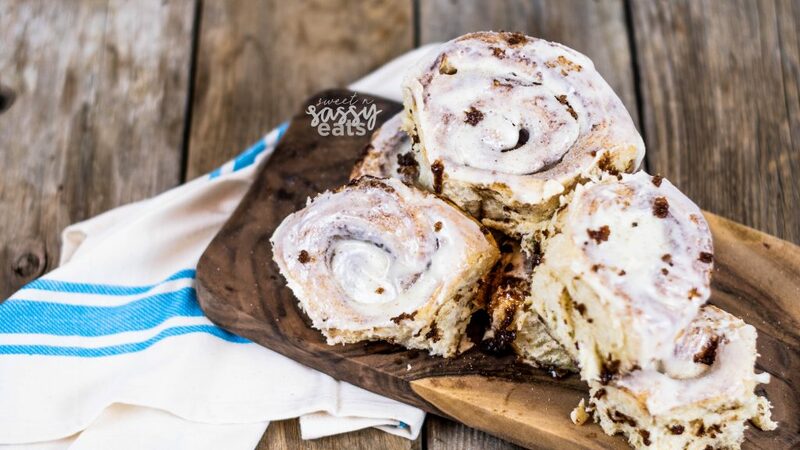 Pull them out a few hours before you plan to bake to let them thaw and rise and BOOM you have delicious homemade cinnamon rolls! So do yourself a favor and double your rolls this year but make a batch of these! One of the most important things is your yeast, it is what makes the rolls rise and be fluffy. You need to use a yeast you know and trust, this is my favorite yeast. The next important thing is to not kill your yeast when activating it. The water you add needs to be warm but not too warm, just slightly above room temperature. I also like to add a couple pinches of white sugar, the sugar feeds the yeast and helps it activate. Next, be sure that your scalded milk has come down to room temperature BEFORE you add your activated yeast. Making sure your butter is cold helps to cool the milk and mixing in the sugar and eggs before the yeast helps too. When you are adding the flour in, add it slowly and gently knead the flour in once your mixer begins to struggle. But try to handle the dough as least as possible. The more you work the dough the tougher the end rolls will be. Also when you are shaping your rolls (after the first rise), try to handle them the least as possible (again it will make them tough). If your dough does not rise during the first cycle then most likely your yeast was bad or it got killed in the process. The second round of rising is not as important, sometimes my shaped rolls do not rise during the second rising, but then once in the oven the grow and are just fine. If they do not rise in the first process, throw out the dough and start again. When cutting your cinnamon roll pieces I find that using unflavored (or cinnamon flavored) dental floss is the PERFECT solution to getting perfectly cut roll shapes without squishing or smashing your rolls. So make sure you have some of that around when making these! I use to worry so much about overcooking my rolls, that I would typically always undercook them. That is until I started using my Thermoworks Instant Read MK4 thermometer! It takes ALL the guesswork out of knowing when the rolls are perfectly cooked. Simply insert the thermometer into a discrete spot on your rolls and get the center temp reading. Rolls are cooked perfectly at an internal temperature of 185, so I shoot for 180-183 to take into account a slight carry over in cook time. So if you don’t have an instant-read thermometer, make sure you get one here! 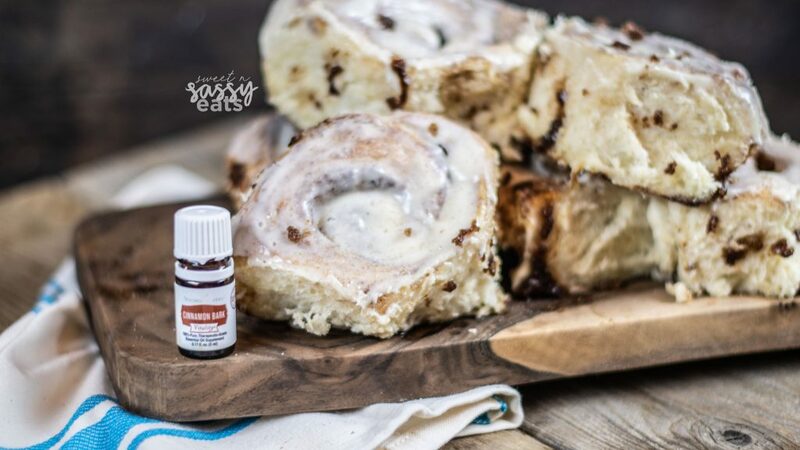 I LOVE the flavor of cinnamon, so I like to give my cream cheese frosting a little BOOST by adding my Young Living Cinnamon Bark Vitality Oil. It is strong, so typically 1-2 drops should be enough! It gives the nice cinnamon flavor but you get the beautiful look of a creamy smooth frosting on top. 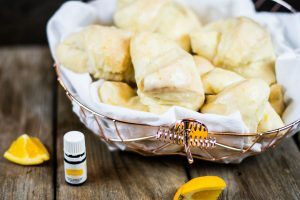 I use this same dough recipe to make dinner rolls with just a couple of slight adjustments. I’ve also made it more savory with garlic, herbs, and cheese. Really the sky’s the limit with this dough recipe! So go ahead and be creative! Add yeast to mixing bowl with 1 Tbsp warm water (I also like to add a sprinkle of sugar to help activate the yeast). Put to the side and allow yeast to bloom. Over the stove scald the milk. (Cook milk on medium, until just before it boils, whisk milk to keep a film from forming. Once scalded, remove from heat and add butter. Once the milk has cooled to room temperature, add sugar, salt & eggs to milk and whisk. Then pour into mixing bowl with yeast, whisk to combine. Slowing add flour; once dough becomes too thick to mix with electric mixer, pour out onto a floured counter and knead until smooth dough forms. Still slightly sticky but not too sticky. Grease mixing bowl, place dough back in and grease the top of the dough, then cover and place in refrigerator. Allow to rise for at minimum 4hrs, but I prefer overnight. Once it has completed it's rise, remove from fridge. Pour dough out onto a floured surface. Knead a few times to get a smooth ball. Separate into 2 sections. Roll each section out into a rectangle about 1/4 - 1/8" thick. Spread 1/2 of your melted butter all over (except for 1/4" all around). Sprinkle with half the cinnamon mixture, just to where the melted butter is. Place on buttered pan, sprinkle with extra cinnamon mixture & cover. Allow for a second rise, about 2 hrs. Meanwhile, make Glaze: Combine all glaze ingredients in mixing bowl, blend until smooth and desired consistency. Adjust ingredients to taste, there is no right or wrong, but when in doubt start by adding salt - this enhances all the flavors already in the mix. Preheat oven to 350 degrees. Brush with melted butter and bake 10-15 minutes. Use an instant-read thermometer, rolls are cooked perfectly once they reach an internal temperature of 185 degrees. Remove from oven, brush with glaze while still warm. ~ When cutting the Cinnamon Rolls, I use unflavored floss to cut it. This keeps me from squishing my rolls when cutting and helps cut evenly.